Life on the ranch becomes tedious for Maggie the magpie and she longs to spread her wings and see the world. When a fox just misses having her for dinner thanks to the intervention of a wolf, Maggie seizes her chance to fly away and leave her old life behind. 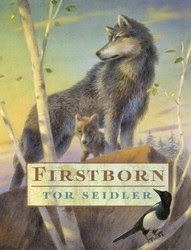 She follows the big wolf named Blue Boy who is on his way to Canada to find his old pack. During the journey, Maggie finds food and Blue Boy hunts it down. She watches Blue Boy's heartache and frustration when finding the fate of his old pack. The blue wolf eventually finds a new pack, picks a mate and settles in Yellowstone. When Blue Boy fathers a litter of pups, Maggie observes his disappointment in his firstborn son, Lamar, who fails to live up to the alpha male role his father expects of him. Seidler eloquently introduces an outdoor world of beauty and true to life wilderness danger while exploring the meaning of true friendship. A touching tribute to family togetherness, love, devotion and forever friends. FTC Disclosure: ARC received at no charge from publisher to facilitate my review.